This article is the continued part of this article: Analyzing the JBoss Remoting Protocol. In this part, let’s see the detail of the JBoss Remoting Protocol. I will use the ConnectionTestCase.testManyChannelsLotsOfData() method in this article. You can find the source code of the test case on Github: ConnectionTestCase.java. Generally speaking, the ConnectionTestCase will startup a server endpoint, and create a client endpoint to connect to the server. The client will firstly send the username and password to the server for authentication. After the authentication is succeed, the client will send some data to the server. Finally the communication is over and server will be closed. 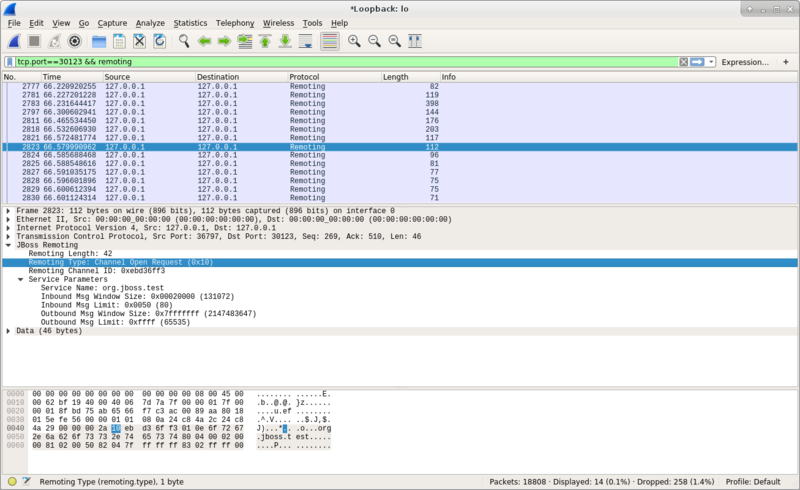 This is a typical communication process, and we will use Wireshark to monitor the network traffic to see the network packets in detail. From the above code, we can see the server will accept the username bob, and its password is pass. This information is stored in server side for authentication, and client will need to use bob/pass to pass the authentication of server later. In addition, the server will accept the SCRAM_SHA_256 encryption method for data communication. JBoss Remoting supports many different encryption algorithms, and the service and client need to negotiate what method to use. We will see the negotiation process between server and client later. Finally, we can see the server will serve at TCP port 30123. 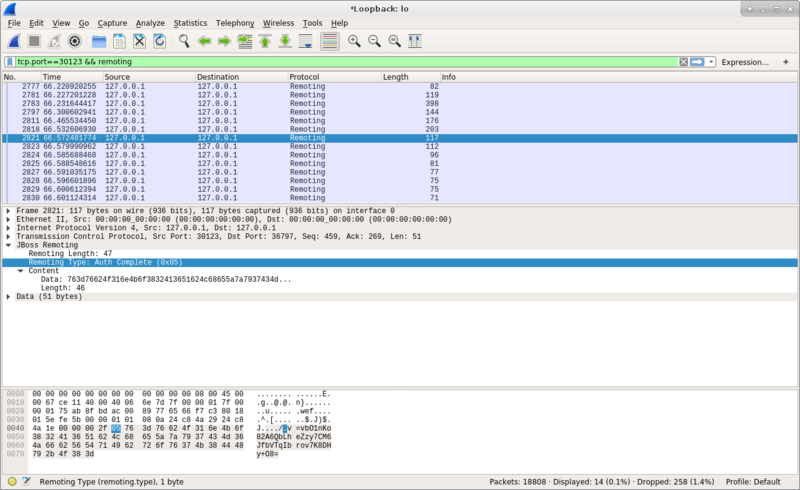 We will capture the data to and from this port in Wireshark later. From the above diagram, we can see the packet type and attributes defined by JBoss Remoting Protocol. We will check the detail later. From the above screenshot, we can see the first data packet is sent from server to the client, because the Src Port is 30123, and the Dst Port is 36797. We know that the server is set to listen on port 30123, so we can understand this packet is sent from server to client. * Sent by server only. From the above code, we can understand that the greeting message is sent from server to client as the beginning of the communication process. In addition, from the above screenshot, we can see the Greeting message contains the Greeting Parametmers. Under Greeting Parametmers, it contains one item, which is Server Name, and its value is localhost. This information will be passed to client side for processing. * Sent by client then server. From the above code and the above screenshot, we can understand the capabilities message contains the information of the communication. From the above screenshot we can see the relative information of this communication is contained in the Capability Parameters. There are multiple fields in Capability Parameters. They are: Protocol Version, Endpoint Name, Supports Msg Close Protocol, Impl Version, Inbound Channel, Outbound Channel. The information will be used for negotiation between server and client to determine the communication details. From the above code, we can understand that the important information encapsulated in Channel Open Request is the Remoting Channel ID, and we can find this information in above screenshot. In addition, the message contains the Service Name the client needs, and together with some other parameters. The Channel Open Ack message is similar to the Channel Open Request, and contains the channel ID used by server to the client. * Always flows from message sender to message recipient. * Always flows from message recipient to message sender. From the above screenshot, we can see the client sent a Channel Shutdown Write message to the server. * Sent when channel writes are shut down. 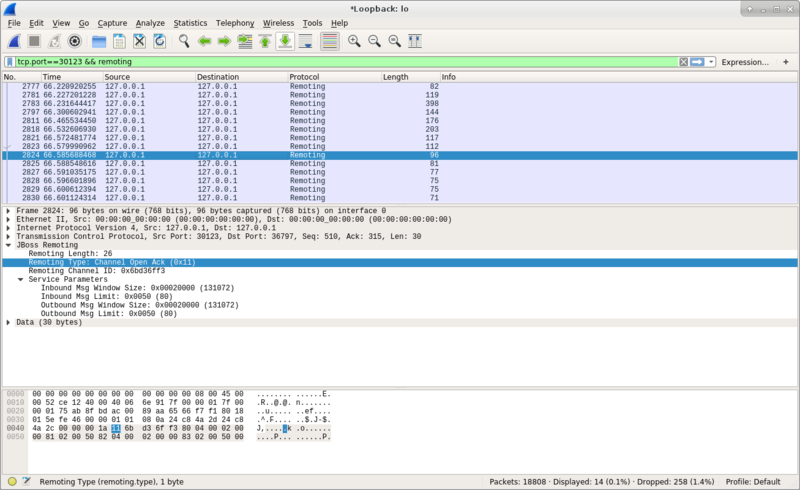 The above screenshot shows the client sent a Connection Close message to the server, and the whole communication is over. In conclusion, we have checked the JBoss Remoting communication process between server and client in this article, and we have checked the detail of the Remoting protocol. We didn’t cover all the details of the protocol, but this article is a good beginning for you to dig into the JBoss Remoting code by yourself.